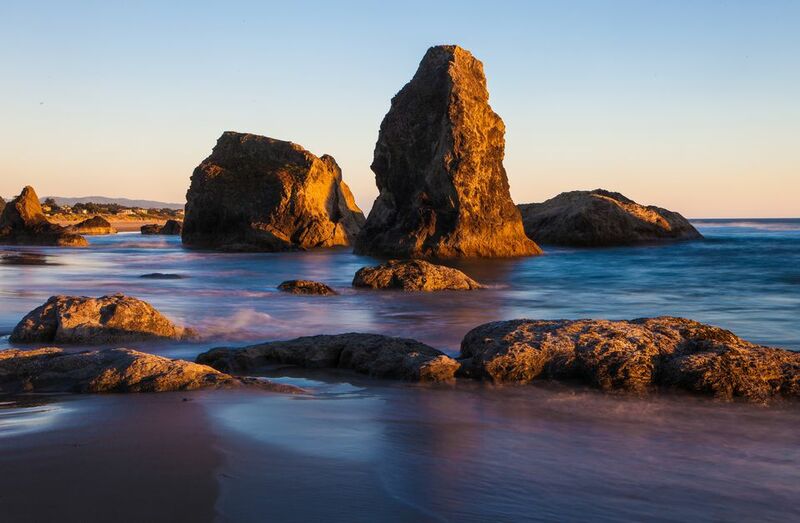 Located where the winding Coquille River empties into the Pacific Ocean, Bandon is one of the many popular getaway destinations located on the southern Oregon Coast. Bandon is known for the highly acclaimed golf courses at the Bandon Dunes Golf Resort. Many of the attractions and activities that make the Oregon Coast so attractive can be found in Bandon including a historic lighthouse, scenic beaches, and unique shops and galleries. The coastline, river, and forest provide opportunities for outdoor activities of all kinds from beachcombing to hiking to wildlife watching. Bandon attracts visitors all year long. When the weather may be blustery, this beach town is a great place to watch the storms roll in and marvel at the high waves. Considered one of the top golf resorts in the nation, Bandon Dunes Golf Resort features multiple courses with magnificent ocean views. Golfers will also enjoy the practice facility and three clubhouses. Trails allow you to experience the region's unique sand dunes while taking in the beach and golf course vistas. Resort accommodations include guest rooms in The Inn, rooms or suites in The Lodge, and a range of vacation home options. Fine and casual dining restaurants are available around the resort complex, along with pubs and lounges. It's one of those places you can enjoy a getaway without leaving the resort. Running along the coastline south of town, Beach Loop Drive provides access to some extremely photogenic viewpoints. These include a series of offshore rocks known as Bandon Rocks and Face Rock. Combined with blue water, white-tipped waves, and broad sand beaches, these rocks are truly stunning. Views can be enjoyed while hiking the trail to the beach where you can explore rocks and tide pools. Another place to stop and wander is Bandon State Natural Area, where you'll find beaches and rugged rocks begging to be photographed. As you drive the two-plus mile route you'll come across shopping, dining, and lodging opportunities. You can access the loop from Highway 101. Coastal getaways traditionally include wandering through local boutiques and art galleries along with locally made sweet treats and fresh-from-the-ocean seafood. Bandon's Old Town district, located by the town's small marina, is your place to pick up the latest beachwear, local art, and Oregon Coast souvenir. Also known as Bandon Light, the Coquille River Lighthouse has become the local icon. Situated on a rocky point at the south end of Bullards Beach State Park, this decommissioned lighthouse is the smallest of the many Oregon Coast lighthouses. When open, visitors can check out the "fog room," which features interpretive exhibits and a small gift shop. This family-friendly state park is located along several miles of beach on the north side of the Coquille River. Day visitors can enjoy exploring the beach on foot, horse, or mountain bike. A boat ramp and picnic area are also available. Bullards Beach State Park has a large campground with spaces for RV and tent campers, yurts, and a horse camp. Bandon Marsh National Wildlife Refuge, located near the mouth of the Coquille River, protects one of the last salt marshes within the Coquille River estuary. While visiting the refuge, you might see sandpipers and plovers by the thousands as well as waterfowl, herons, and falcons. Visitors enjoy the great view from the Bandon Marsh Observation Deck, located at the south edge of the refuge, which includes an accessible viewing platform and stairs leading to the mudflats. With miles and miles of cranberry bogs, Bandon is often called the "Cranberry Capital of Oregon." The cranberry is celebrated annually during the second weekend in September. Bandon Cranberry Festival events include a fun run, food booths, eating contests, and the Coronation of the Cranberry Court.